20 muffin tins, fairy cake tins or egg tart cases. Preheat oven to its highest temperature. In a small saucepan, mix the syrup ingredients together and bring to boil. Over a medium heat, reduce the syrup by about half (you need to end up with 225ml/8gl oz/ 1 cup), then remove from heat and then leave to cool. In a mixing bowl, combine the eggs and cooled syrup and pass through a sieve twice, to remove the stringy parts of the eggs. To avoid excess caramelization and potential burning when cooking, carefully remove any bubbles from the egg mix by skimming the bubbles off the top, then wiping around the sides of the bowl with kitchen paper to remove any smaller bubbles at the edge. Dust your work surface with plain (all-purpose) flour to prevent the pastry sticking, then, using a 7cm (2 3/4 inch) round cookie cutter, cut the ready-rolled puff pastry into circles. Line 20 muffin tins, fairy cake tins or egg tart cases, if available, with the pastry and press it firmly into place, making sure the pastry is flush against the sides to prevent bubbling during baking. Just before putting the tarts into the oven, bring the heat down to 230°C/ 210 °C fan (450°F). Place the tart cases on a baking tray and pour some of the filling into each tart, taking care not to fill them any more than two-thirds of the way up. Place the tarts on the middle shelf of the oven, making sure there is another spare wire shelf above, and bake for 8 minutes. 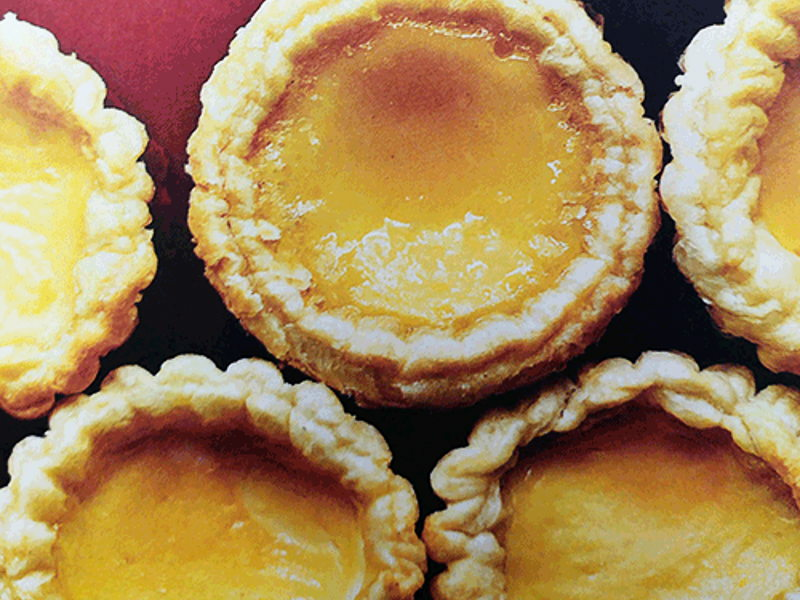 After 8 minutes, turn the oven down to 210°C/190°C fan (410°F) and slide a cool baking tray on to the shelf just above the egg tarts, to stop the filling browning too much. Bake for a further 8-10 minutes, until the filling starts to ‘dome’. Once this happens, the tarts should be cooked through. Remove from the oven and allow to cool slightly before serving.